The Ontario government is currently reviewing the province’s employment laws. The Ontario Federation of Labour (OFL) is using this once-in-a-generation opportunity to bring in sweeping changes and create a better Ontario for all. Make it Fair is a campaign to mobilize labour unions to fight for labour law reform, in solidarity with the Fight for $15 and Fairness campaign. The OFL and unions across Ontario recently launched a membership survey to talk to union members about their experiences of precarious work and the experiences of their family members. Together, let’s tackle precarious work and change Ontario’s out-dated employment laws. Have you ever been in a precarious job? Have you worked a string of contracts or part-time jobs? Are you concerned about the rise of temporary, part-time, contract or dangerous jobs? 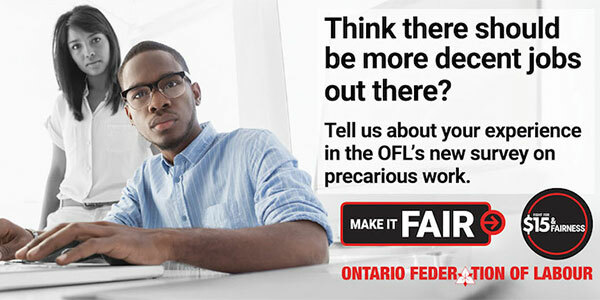 Fill out the OFL’s Precarious Work Survey online. On Saturday, October 1, 2016, starting at 1:00 p.m., come out to a rally for decent work to call for safe working conditions, decent hours, paid sick days and vacation, access to a union, $15 minimum wage, an end to the gender/racialized wage gap, and much more. 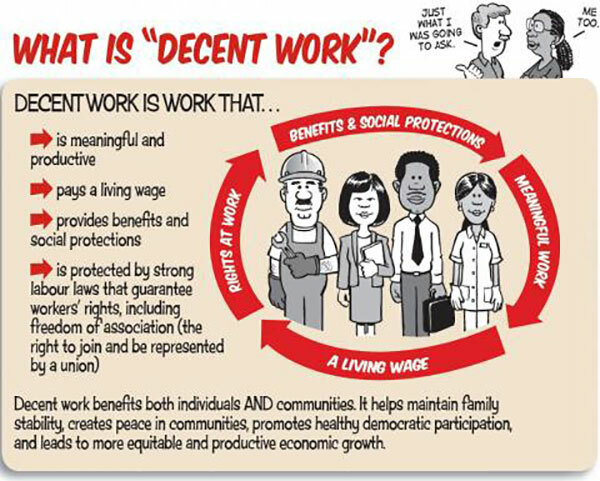 For more details about the rally at Queen’s Park, please visit the Decent Work Facebook page. It’s time for government to listen. We have the power to make sure that the Ontario Government understands what is truly at stake for workers in this ongoing labour law review. Take action to help win fair working conditions for everyone. Share support of $15 and Fairness on Facebook and Twitter. Come out to a local $15 and Fairness event.